This travel diary is a labor of love for our family and friends back home and around the world. This year starts off with Annie and a friend visiting New Zealand and Australia (Melbourne & Tasmania) in March. Then, in August, we'll visit Ireland and the rest of the British Isles for six weeks. In November, we'll explore our last continent, Antarctica, and also Patagonia and Paraguay. Each year we create a new diary so please click below to view previous trips. Latvia, Lithuania, Ukraine, Slovenia, Serbia, Bosnia & Herzegovina, Croatia, Montenegro, Kosovo, Macedonia, Albania, Greece, Egypt, Bahrain, Qatar, Oman, Ethiopia, Kenya, Zimbabwe, South Africa, U.A.E. and Denmark. Panama, Colombia, Ecuador (inc. Galapagos), Peru, Bolivia, Chile (inc. Easter Island), Argentina, Uruguay, Brazil and Mexico. France (Paris and Lourdes), Armenia, Georgia, Azerbaijan, Kazakhstan, Uzbekistan, Kyrgyzstan, Spain, Andorra, Morocco (Tangier), Gibraltar, Portugal and the Netherlands (Amsterdam). My friend Diane and I left the town of Franz Joseph to drive toward the Franz Joseph Glacier Valley where we'd planned to go on several hikes. It was the first time I remember seeing red-colored rocks like these in the gravel bed. Diane and I remarked that neither of us had come across speed bumps like these before. These ones really forced drivers to slow down! 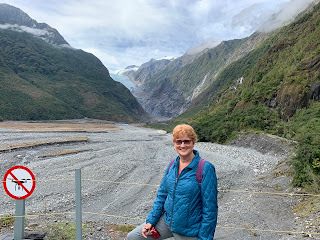 A little further on was our fist sight of the magnificent Franz Joseph Glacier we'd come to see and hike on. The picture looks pretty drab because it was very overcast and drizzly then. It was strange seeing a rainforest in the middle of the Southern Alps on New Zealand's South Island! We probably shouldn't have been surprised at the sight because it seemed there were rain forests all over the country. In 1908, the glacier ended here. Glaciers, as you likely know, are simply rivers of ice. High in these Southern Alps, snow builds up until it compacts into ice under its own weight. The ice then flows downhill, carrying debris with it and carving u-shaped valleys. Though Franz Joseph Glacier seemed motionless, it could shift up to five meters a day! The ice can pick up and carry rocks for several kilometers. As they retreat, glaciers leave debris behind in mounds called moraines. A sign indicated the average global temperature in 1908 was 13.57 degrees Celsius but it had risen in 2016 to 14.87 degrees Celsius. Helicopters were the only safe way to get people onto the glacier itself for guided walks. But Diane and I were content to hike toward the viewing point. As this hike gets mobbed in the summertime, tourists were advised to visit the glacier before 8 in the morning or after 6 in the evening. Glacier visits have had to change because this landscape was on the move every day as the glacier retreated. Even though we were there in the early fall, there were still plenty of people on the track, so many, in fact, that we always had to keep to the left. The river was gray because of the 'rock flour' or literally rocks that had been ground up by the forces of nature. The Glacier Valley walk was a hike up the valley floor to a viewpoint close to the glacier face. The walk was over exposed, rough ground and involved crossing dry riverbeds at that time of the year. We were lucky that the viewing location didn't change due to flooding and rock fall hazards. The riverbed was bone dry fortunately when we had to walk across it en route to the viewpoint. The Southern Alps were among the fastest growing mountains in the world, rising 10-20 millimeters per year. In the past few million years, they have risen more than 20 kilometers - over six times higher than they currently stand. All the rock has been ground down by water and ice. Flooding and rock fall change the landscape daily which creates challenges and hazards for visitors to the glaciers. On the way back to the parking lot, I collected different-sized rocks so Diane could built a rock cairn in memory of her husband, Ron, who always liked building them when they hiked. As the human population increases, we consume more resources and emit more greenhouse gases like carbon dioxide into the atmosphere. Greenhouse gases trap heat from the sun, insulating the planet like a huge blanket. As global temperatures rise, glaciers all over the world melt faster. Franz Joseph Glacier has retreated several kilometers over the past 150 years, and will continue to lose ice as the climate warms. 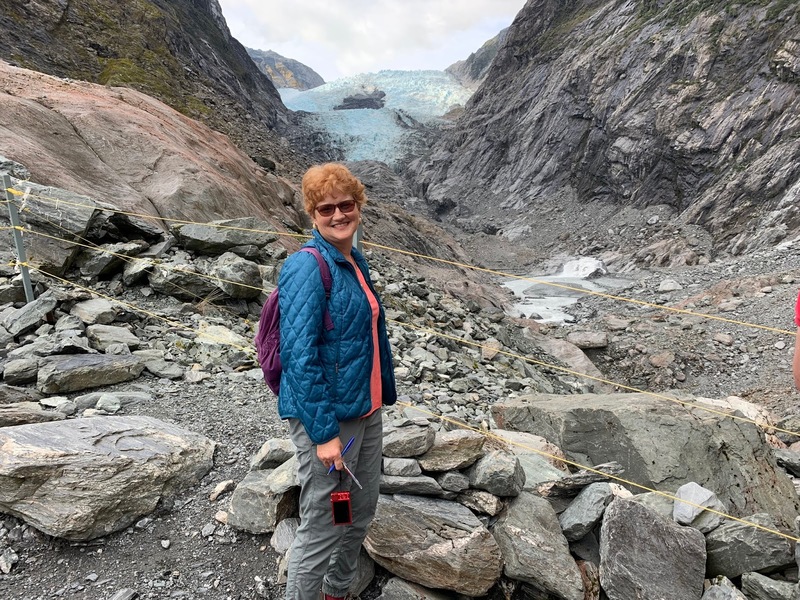 It was disturbing to see how much the glacier had retreated in my own lifetime and to see first-hand the effects of global warming. The rocks had been collected to divert the runoff. There were so few flowers along the trail, these looked especially attractive. The terrain changed very quickly all of a sudden. Before this, we had seen the force of water. In 2009, the glacier ended here at the gravel path. As glaciers thaw, dirt and rocks covered the terminus or end. The debris insulates and preserves the ice at the terminus, but the cleaner ice higher up keeps melting. Eventually, the debris-covered ice separates from the rest of the glacier and can be left behind in the valley. 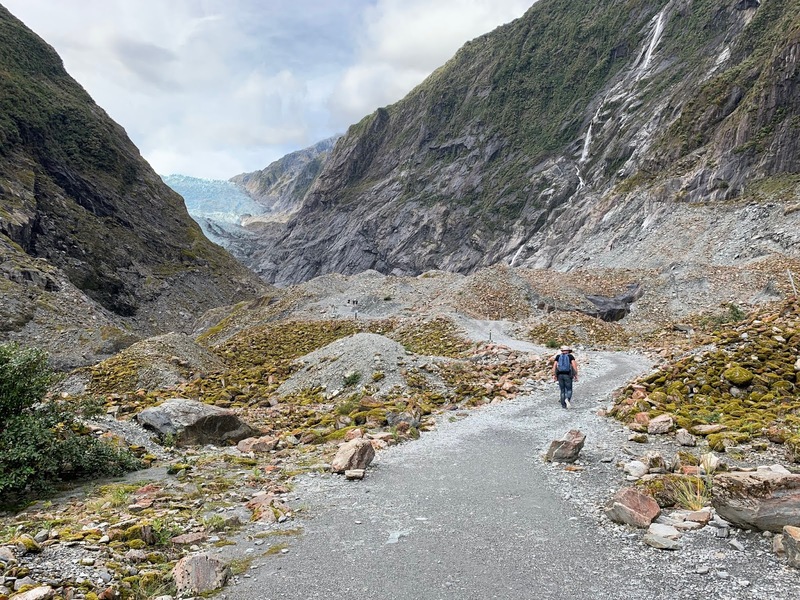 That was how Franz Joseph Glacier keeps shrinking. Even if global warming stopped today, glaciers would continue to retreat for at least a few more years before stabilizing. The global average temperature in 2009 was 14.59 degrees Celsius but it rose to 14.87 degrees Celsius in 2016. Diane and I kept passing and being passed by this couple from Arizona on the trail. Fortunately, there were far fewer people on this stretch of the track which made it so much more pleasant. Eighteen thousand years ago, Franz Joseph Glacier extended to the sea. Today the terminal face was 19 kilometers from the shore because of a warming climate. Even within the short time since the first Europeans came to New Zealand, the glacier had shrunk considerably. An uncertain future for the glacier: More rain and less snow is the forecast for the Southern Alps. 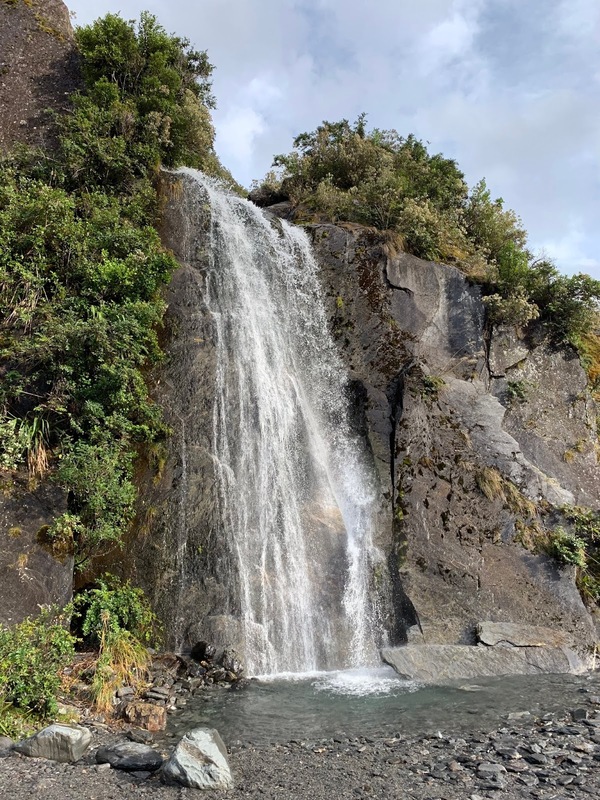 Increasing global temperatures are expected to cause New Zealand's glaciers to continue to shrink for the foreseeable future. I wonder how much farther up the valley future generations will have to walk to visit the glacier. We overheard a guide say the glacier moves like a river but at a much slower rate of speed. It was one thousand feet deep at its thickest part. The steepest part is what we were looking at. Its main ice field moves about twenty feet a day; unlike most glaciers, this one has been advancing and retreating seven times in the last hundred years due to El Nino. He added that Franz Joseph has lost three thousand feet in just the last eleven years because of the La Nina part of the cycle - a number that seemed truly mammoth. The glacier was named after European explorer Julius von Haast in 1865 after the then Emperor of Austria-Hungary. This was as far as anyone could hike on the trail. It would be fascinating but likely sad to return to this spot in ten years or so to see where the glacier would be then. 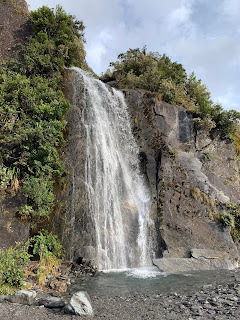 After completing the Glacier Valley Hike, we were still eager to see more of the glacier so did the Sentinel Rock Walk that also took us through another rainforest, naturally! Steven and I have been very fortunate in seeing some spectacular reflections on our many travels but none of them came close to what Diane and I saw at Peter's Pool. It was without a doubt the most gorgeous one I'd seen. I just hope these photos can do it justice. Peter's Pool was a kettle lake formed by a huge block of ice left behind during the glacier's withdrawal. When this ice melted, it was contained in a depression - known as a kettle hole - among the mounds of rock debris deposited by the receding glacier. It was hard to know what was up and what was down because of the almost perfect mirror image. Clicking on any picture opens it in a different window for a larger and clearer view. Want to receive each new 2019 post via email? Just fill out the rectangle below and enjoy! YOU CAN'T LEAVE A COMMENT IF READING IN EMAIL FORM! IF YOU WISH TO LEAVE A COMMENT AFTER READING, JUST CLICK ON THE BLOG LINK AT THE BOTTOM OF THE EMAIL AND THE FULL BLOG WILL OPEN AND YOU CAN LEAVE A COMMENT AT THE END OF THE POST. ANOTHER OPTION IS TO CLICK ON THE POST TITLE IMMEDIATELY AFTER OPENING THE EMAIL AND READING DIRECTLY FROM THE BLOG WHERE THE COMMENT WINDOW APPEARS AT THE END. Want to find a post about a place from this year? There are 3 different ways. 1. Type in a key word in the search rectangle below. 3. Open up every month in the archive below and search through the titles listed by date posted. Many posts may come up when searching for a place. When you're done reading the 1st post select "More Posts" to continue on to others. LOOKING FOR A POST FROM PREVIOUS YEARS? Just click on any country below to see posts from previous years. Once the new blog opens, either use the search rectangle, click on the city or country label or open every month listed under "Archive" to see the titles of posts to better refine your search. If the comment window above isn't open, click on the words "No comments", "1 comment" , " 2 comments", etc. and the comment window will open for you to leave a comment and read other comments. Clicking on the post title before reading also opens the dialogue box. Always check the "Notify me" box after you make a comment so you can read replies and see further comments. NOTE: Some computer settings will not allow you to open your google account to leave a message (the computer must be set to accept 3rd party cookies). If that happens just leave a comment using "anonymous" and add your name and email address (if you want) at the end so we can respond directly. Remember, we love to hear from you!!!! Click on the word "Home" that appears above.